C-SPAN After Dark: Alcee Hastings' Cher-Like Awards Show Acceptance Speech. Last, but certainly not least, I have a video from Jay over at Stop the ACLU. On it, CAIR is caught selling anti-Judea-Christian literature to a terrorist. Nice of our gov't, wouldn't ya say? I guess we're paying them to kill us. This has to be stopped. You may find it here: CAIR Jihadist Supporters Caught Red Handed Selling Anti-Christian/Anti-Jewish Materials In Public Park. Get out of my country! Have a nice evening. Sharing these videos with Woman Honor Thyself: Autism and Gina Marie Incandela, Potbelly Stove: Climate Change: The GOP 'Gets it', Right Voices: The Obama administration has blocked Israelâ€™s request for advanced U.S.-origin attack helicopters, third world county: Now, I Wouldn’t Go This Far, But…, Dumb Ox Daily News: Sotomayor Typical Bobble=Head Lib, The World According To Carl: Memorial Day 2009, and DragonLady's World: Don't Worry, thanks to Linkfest Haven Deluxe. It is with great sadness and anger that I report this story. In San Diego, California, Pastor David Jones and his wife were ordered not to conduct Bible Studies in their home with approximately 15 Church members through 'a written warning that listed 'unlawful use of land' and told them to 'stop religious assembly or apply for a major use permit' -- a process that could cost tens of thousands of dollars'. I believe just by typing Amendment I, I have made my case. Now show me where the government finds its rights, which it is granted only by us and we have not forfeited them, from this? Do they not understand what it means when it says YOU SHALL MAKE NO LAW? Ah, but you say that only applies to Congress, right? Wrong. Let me explain. A city cannot make a law which contradicts the laws of the state, neither can the states make a law that is contrary to that of the federal government. This is one of the precious reasons we did not hand over all of the so-called rights this government seems to be able to find when they so desire, yet cannot read their own bills which they pass. We must stop this madness, and stop it now. For this pastor and his family and for our very posterity, this cannot stand. Here are some links to the story: Couple: County Trying To Stop Home Bible Studies (with videos) Channel 10 News, UPDATE: Deadline set in banned Bible study case Demand letter warns of 'irreparable' harm from First Amendment violation World Net Daily and County puts kibosh on home Bible study One News Now. Today I am having an open trackback courtesy of Linkfest. This means you can (track)post your best post here. Remember to link me to your article before you trackback. You don't have trackbacks available? Why not use Wizbang Stand Alone Trackback? Everyone have a nice day. Here are some great posts from my friends I'd like to share with you: third world county: Now, I Wouldn’t Go This Far, But…, The World According To Carl: Memorial Day 2009, Dumb Ox Diary News: Sotomayor Typical Bobble-Head Lib, Gulf Coast Hurricane Tracker: Who's the real activist?, The Pink Flamingo: Proof Ron Paul Bots & Libertarians Out to Destroy Lindsey Graham!, and Woman Honor Thyself: Memorial Day, thanks to Linkfest Haven. 1. Woman Honor Thyself: Autism and Gina Marie Incandela. 2. Potbelly Stove: Climate Change: The GOP 'Gets it'. 3. Right Voices: Michelle Malkin Â» Holder undermines Georgiaâ€™s voter verification rules; ACORN cheers. 4. Gulf Coast Hurricane Tracker: #1 Daughter reaches milestone. Cross-posted @ TCU, SGP and Rosemary's News and Ideas. Digg! There used to be a time when unions were absolutely necessary. As of late, however, it appears employees have to fend for themselves between the company and their union bosses. Check this out. A bill to eliminate secret ballot election in the workplace is currently making its way through Congress. Something like this could never happen, right? Actually, it could. Under the so-called “Employee Free Choice Act,” workers, in violation of our Democratic principles, would be denied their American right to a private ballot in union organizing elections in the workplace. Workers would be forced to publicly state their vote -- for everyone to see. This is more appropriately called the FORCED CHOICE ACT and would fundamentally change the rights of employees in the workplace … it would force unions on them; force contracts on them and force payment of dues on them. The Workforce Fairness Institute is an organization committed to educating voters, employers, employees and citizens about issues affecting the workplace. To learn more, please visit: www.WorkForceFairness.com. And these are the people who want to raise OUR taxes? Now we know why, eh? WASHINGTON (May 29, 2009) – Footage of a controversial U.S. aerial bombing in Afghanistan this month shows the strike targeted Taliban militants, the commander of U.S. Central Command said Friday. Army Gen. David H. Petraeus told National Public Radio that he recently watched a video recorded by an aerial bomber involved in the May 4 firefight in Farah province between a joint U.S.-Afghan force and Taliban insurgents. The battle resulted in the death of Afghan civilians — with U.S. estimates ranging from 20 to 30, but the Afghan government’s as high as 140. Petraeus said the video, which likely will be shown to the media at a later date, does not disprove that civilians were killed, nor did he dispute that they were. But the footage proves that the targets of the strikes were Taliban insurgents waging an ambush against the combined U.S.-Afghan force, he said. Petraeus expressed concern about civilian causalities and described the tension between the need to protect the Afghan population but also to allow for coalition forces to use the capabilities — including air strikes — at their disposal. “And that's this tension, if you will, between, again, employing all the assets that we have, but making sure that we do it in a way that doesn't undermine the overall effort — which is the result if, indeed there, [are] significant civilian casualties,” he added. Defense Secretary Robert M. Gates, speaking about the Farah battle earlier this month, expressed the need to continue reducing civilian casualties in Afghanistan. In a May 11 news conference at the Pentagon, he cited one measure of progress — a 40 percent drop since in the first few months of 2009 compared to a year earlier. Cross-posted @ Talon and Rosemary's News and Ideas. Digg! "The eyes of the world being thus on our Country, it is put the more on its good behavior, and under the greater obligation also, to do justice to the Tree of Liberty by an exhibition of the fine fruits we gather from it." "It has long, however, been my opinion, and I have never shrunk from its expression ... that the germ of dissolution of our federal government is in the constitution of the federal Judiciary; ... working like gravity by night and by day, gaining a little today and a little tomorrow, and advancing its noiseless step like a thief, over the field of jurisdiction, until all shall be usurped." He saw it coming, and no one listened. "The Constitution ... is a mere thing of wax in the hands of the judiciary which they may twist and shape into any form they please." CAMP BUCCA, Iraq (May 28, 2009) – Air Force Airman 1st Class Alberto Lopez knew the guy was hiding something. He could feel it. The detainee was giving off "the vibe" that three months of working the visitation center at the theater internment facility here had taught the airman to detect. The Altus, Okla., native continued to search in the efficient, humane and dignified way he was taught, waiting for the “tell” that would give away what the man was hiding and where. The detainee glanced down at just the wrong moment, and Lopez had him. The find: a rolled up piece of paper with contact information. Contacts for whom, Lopez didn't know, but they weren't getting outside the gate that day. The find was one of nearly 40 instances when Lopez discovered contraband in the course of a standard search of detainees going to see their families. "It makes me feel like I'm really doing something," Lopez said. "Finding information, numbers, names, addresses, … you name it." Finding contraband, an almost daily occurrence, is one goal of airmen with the 887th Expeditionary Security Forces Squadron strive for as they process more than 750 detainees a week during visitation hours. The airmen on visitation duty must walk a fine line, conducting their searches as efficiently as possible while respecting the dignity of those they search and protecting other detainees, visiting families, and their fellow airmen, soldiers and Iraqi correctional officials. "I think everyone on our team has an efficient way of searching," said Airman Randal Landers, an 887th ESFS guard. "So they're not going to try slipping anything by anyone here. If they do, it gets found." Contraband -- anything not issued to the detainees -- can encompass a wide variety of items from the seemingly benign, such as letters, to the downright frightening, such as improvised weapons. The security forces airmen must constantly be on their toes and remain alert. Despite the danger to the airmen or the risk of information getting into enemy hands, the visitation program is an important piece of the ongoing counterinsurgency operation as well as a right under the Geneva Convention. "We give [the detainees] the opportunity to meet their families," said Air Force Tech. Sgt. Jeffrey Tobin, 887th ESFS Visitation Flight chief. "It puts them at ease, shows them we hold true to what we said by treating them with dignity and respect." Originally from Norristown, Pa., but deployed from Schriever Air Force Base, Colo., Tobin said the security forces airmen are held to strict standards that allow them to search efficiently without risk of violating a detainee's dignity and respect. "The rules and guidelines are already set forth," he said. "It's not open to interpretation. As long as the guard force understands that, understands their role in it, there should be no issue in conducting the fair treatment that's expected of us. It's not a limiting factor to finding contraband. The contraband is there. We're doing what we're told, and the contraband is presenting itself rather easily." For the security teams, whether or not there should be visitation is obvious; it is a basic human right and legal obligation. And, the airmen note, it is a matter of human decency. "I know if I were detained, I'd want the right to visit my family and just see them for a couple of hours," Landers said. "It's just basic human treatment." Air Force Col. Alan Metzler, 586th Air Expeditionary Group commander, under which the 887th falls, highlighted the power of human decency in performing this mission. "Through these thousands of contacts with detainees and their families, we've learned one powerful, irrefutable fact: that our most important weapon in gaining their support for our strategic objectives in Iraq is our values as airmen and our values as Americans," Metzler said. As powerful as the weapon is, it doesn't remove the constant threats the airmen face or eliminate another dangerous enemy - complacency. It's an enemy they must face themselves. "It's not a physically demanding job, but it's a mentally demanding job in the sense that it's repetitious," Tobin said. "You have to stay motivated and understand what the goal is and the strategy behind all this." The best tools against complacency are motivation and teamwork, Tobin said. The airmen have to look out for one another and keep each other sharp...They have to maintain their focus and their teamwork," he said. "Their best critics are their own peers." Air Force Airman 1st Class Raymond Garcia, an 887th ESFS guard, said the thought of the possible consequences and of harm that could befall their wingmen if they don't remain sharp keeps complacency at bay. "There's been times when everybody gets the thought that, 'Hey, it's hot outside; I really don't want to complete the whole search,’ and be lenient with them,'" Garcia said. "But then you have to remember that, what if that one time this individual happens to have a small, one-by-four inch shank hidden in his pants, and he comes out with it, and one of your friends gets hurt … because you wanted to hurry and get in the building where the air was? “Everybody has thoughts of getting complacent,” he continued, “but me, personally, I get in there, and I do the mission the way I was taught to do it and make sure I do it right every time. That way, everybody can go home in one piece and get back safe." Lopez agreed. "I can't get complacent, because I can't let something get by," he said. "We have to remind each other. Some of these detainees, we don't know exactly what they've done, but we know they had to do something pretty bad to be in here. You can't be all friendly or turn your back on them, because they can flip on us any second. I can't get complacent." The risks don't come without the promise of reward. Already, the efforts of the 887th are paying long-term dividends outside the visitation center and beyond Camp Bucca's gates. "The long-term aspect is that we're influencing family members from all over Iraq," Metzler said. "They can go back into their family units and say, 'We trust the Americans. We have seen them and how they operate, and they treat us with respect.' Because we treat everyone with dignity and respect, we have earned their respect as a result." It's an effect every member of the visitation unit is aware of, said Air Force Staff Sgt. Keri Embry of Cross Plains, Tenn. The 887th ESFS member works with the visiting family members, processing them and even coordinating medical attention for those visitors who need it. "It's a good thing to maintain that humanity to show the people here that we're not bad people, that we're trying to help them as much as possible," she said. "The Iraqis, as a whole, see that we do care what happens to them, that we're not just here to find the bad guys. We're trying to help the whole country get back on its feet." The impressions the guards make on detainees and family members can be lasting ones. Garcia said he sees signs of that trust every day. "We have a really important mission here," he said. "Not only are we working with the detainees, but we're working with the kids too. So these kids grow up, and they remember how the airmen gave them snacks and interacted with them. A lot of the visitors will let them hold their kid when they cry, so it's almost like we're getting in there on a personal level. A lot of visitors will hopefully remember what we're doing here and keep that in mind that a lot of us are really good." Metzler said each of his airmen is teaching these families what being an American means. "They learn from our airmen," he said. "Through the dignity and respect that we pay them, they learn about Americans. And the immediate effect is that they feel safety, security and trust. They tell us that. We see that." WASHINGTON (May 27, 2009) – Southern Iraq is “a much better place to live and raise a family than it was a year ago,” thanks to tremendous strides in security, governance, job opportunity and essential services, the commander of the 1st Cavalry Division’s 4th Brigade Combat Team said Wednesday. Army Col. Philip Battaglia described two major lines of progress he’s seen since his “Long Knife Brigade” arrived at Multinational Division South last year: one focused on security and the other, on local government. “The Iraqi security forces have developed into a professional, lethal force, capable of independently securing their citizens and its sovereign borders,” he said. Battaglia noted the role these forces played during Iraq’s recent provincial elections, for which they took the security lead at a time of “increased vulnerability.” In addition, the Iraqis took security responsibility for the 5,000-year-old Ziggurat of Ur, an ancient national treasure that previously had been protected by coalition forces. Battaglia called the transfer a high point for him and his solders and a highlight of their deployment. Meanwhile, the Long Knife Brigade has worked hand in hand with the Iraqis to improve governance. This, he said, has improved local government’s capability to provide essential services and economic opportunities to their people. Battalgia outlined projects the provincial reconstruction teams and his brigade civil affairs soldiers have helped the Iraqis advance to improve infrastructure, deliver services and create jobs. “We have had an amazing year, and we are proud to have been part of all these recent successes,” he said. “Due to the tremendous efforts of the Iraqi people, the Iraqi security forces, … the provincial reconstruction teams and the coalition forces, the three provinces of southern Iraqi are much better and safer places,” he said. Battaglia praised his soldiers for their hard work and dedication and thanked the families and friends at home who supported them during their deployment. Cross-posted @ Talon, and Rosemary's News and Ideas. Digg! Tuning In: May 5, 2009. The helicopter took us deep into the jungle, and from there we picked up the track. Since it was primary jungle, the undergrowth was scant. The enemy could have gone any direction. We moved for 7½ hours, during which time we stayed on the track, but found only one boot print, and finally half of another boot print. At around the eight hour, we had walked some miles, and were starting to find a few obvious boot prints. If this were Afghanistan, we would have caught up to the enemy. The tracking course has ended. It's astounding that every U.S. combat troop has not been through similar training. As it is, only small handful of U.S. troops can track anything less than Bigfoot. Please read "Making Tracks." Am going straight into other training with British forces who will deploy to Afghanistan. Gurkhas in the British Army are preparing to return to Afghanistan. Others are serving there today. Several days ago, a Gurkha was lost to a suicide bomber. His name was Corporal Kumar Pun. This morning, one of Pun's friends told me that his wife had recently delivered a child. Everybody I have spoken with very much liked Pun. They say he was an excellent soldier and a good man. In total, four British soldiers were lost in a period of 24 hours. The soldiers are honoring their comrades and also taking this training very seriously. Also, General McKiernan is to be replaced in Afghanistan. Lieutenant General Stanley McChyrstal will take the top spot. McChrystal has a great repuation for the fight, but he comes from a special operations background. Our special operations forces are incredible fighters, but they can be counted on to lose even the easiest of press battles. This war is largely being fought in the press. I would tend to expect the Taliban bodycount to increase, but also that we will not be able to find the light switch to the press. The special operations world basically "owned" the Afghan war for years. Everybody seemed to have gotten what they wanted; a war without media scrutiny. Our special operators won many battles. But look at Afghanistan today. Gates, Petraeus, McKiernan, McChrystal and Rodrigues: 5/13/09. The command shakeup in Afghanistan has many people talking. I've been with the British Army. British officers have many questions about the change. I have no special knowledge of the situation other than a couple of hunches based on recent experiences. I can say that of my concerns about AfPak, U.S. military leadership is at the very bottom of the list. Our leadership is strong and experienced. In broad strokes, I'm simply not concerned. I am greatly concerned about AfPak, though. The situation continues to rot. Please see read: Gates, Petraeus, McKiernan, McChrystal and Rodriguez. Am leaving Borneo today and heading back to the war in the next week or so. Please see the photos on Gurkha III. Return of General Lee: 5/14/09. Having left Borneo, am turning myself back to the war. Meanwhile, interesting news about the "General Lee" has come in. Many folks might recall the "General Lee." The General Lee is a Stryker fighting vehicle that was blown up, along with crew, several times in Iraq. The crew survived and kept returning to battle, but finally the General Lee took a very hard shot. Captain Brad Krauss was the Commander of the General Lee when it kept getting blown up. I asked Captain Krauss if he could write a few words about his crew and the General Lee. Please see the good Captain's response. Strykers will soon be fighting in Afghanistan. The Taliban will not know what hit them. Base in Afghanistan Increases Internal Security: 5/16/09. Military at Kandahar Airfield has instructed contractors on base to wear body armor and helmets, and carry ID at all times. Please see. U.S. Special Operations Forces are missing a crucial piece of training: They can't track men on foot any better than a weekend hunter could track a buck. Please see "Tracking Afghanistan." Night Shots from Iraq: 5/20/09. Was heading to Pakistan next week before diving back into Afghanistan for the long haul, but there has been a slight adjustment over the last few hours; heading to Philippines first. Please stay tuned. Please see these helicopter photos from Iraq. In Honor of Veterans: 5/25/09. a. The number of physicians in the U.S. is 700,000.
b. Accidental deaths caused by Physicians per year are 120,000. c. Accidental deaths per physician is 0.171.
a. The number of gun owners in the U.S. is 80,000,000.
b. The number of accidental gun deaths per year (all age groups) is 1,500.
c. The number of accidental deaths per gun owner is 0.000188. Remember, "Guns don't kill people; doctors do." Note: Out of concern for the public at large, I have withheld the statistics on lawyers for fear the shock would cause people to panic and seek medical attention. With gracious gratitude to my brother, who knows how I feel about that them doctors, I would like to tip my hat! Oh yes, and gun RIGHTS, too! Thank you, Mr. GrassRoots. Friends I would like to share this with: Blog @ MoreWhat.com: Open Trackback Linfest Haven Weekend, Nuke Gingrich: Breaking News - Latest News - Current News - FoxNews.com, Woman Honor Thyself: Memorial Day, The World According To Carl: Some Thoughts About The State Of The WWE, The Pink Flamingo: RNCS New Daily Ad, and Leaning Straight Up: Greg Gutfelt on ReasonTV Speaking: The truth is never dull, thanks to Linkfest Haven Deluxe. 1. Beagle Scout: Wayward Republicans need to be herded back to civilization. 2. Beagle Scout: CAFE Standard Death Traps. 3. Potbelly Stove: Call for action: H.R.2454. 4. Beagle Scout: CAFE Standard Death Traps. 5. Gulf Coast Hurricane Tracker: 2009 Hurricane season predictions. 6. Woman Honor Thyself: Shaun Smith: Britain’s Got Talent. 7. Right Voices: The Obama administration has blocked Israelâ€™s request for advanced U.S.-origin attack helicopters. Cross-posted @ Talon, TCU, SGP and Rosemary's News and Ideas. "The freedom and happiness of man...[are] the sole objects of all legitimate government." "This Government, the offspring of your own choice, uninfluenced and unawed, adopted upon full investigation and mature deliberation, completely free in its principles, in the distribution of its powers, uniting security with energy, and containing within itself a provision for its own amendment, has a just claim to your confidence and your support." "There is no maxim in my opinion which is more liable to be misapplied, and which therefore needs elucidation than the current one that the interest of the majority is the political standard of right and wrong.... In fact it is only reestablishing under another name and a more specious form, force as the measure of right...."
CHAKLALA, Pakistan (May 21, 2009) – A third U.S. Air Force C-17 Globemaster III aircraft landed here today bringing emergency aid promised by the Department of Defense to the people of Pakistan who have evacuated the war-torn Swat Valley. Over the past 24 hours, three such aircraft delivered relief supplies here, part of $10 million in supplies pledged by DOD. The military effort is in addition to $100 million in various forms of aid from the U.S. government. "This is the [shipment] of humanitarian aid Secretary of State Hillary Clinton announced," said U.S. Ambassador to Pakistan Anne W. Patterson. The three airlift missions brought materials specifically requested by the Pakistan government to support its massive effort to care for the nearly 1.7 million citizens displaced by fighting in the northwestern provinces. Pakistan's request to DOD included 120,000 pre-packaged Halal meals, environmentally controlled tents, electrical generators, and water trucks. "Pakistan has been relentless in their attempt to put an end to insurgent operations," said U.S. Navy Rear Adm. Michael LeFever, Chief of the Office of Defense of the Republic – Pakistan. A key part of that effort is providing adequate care for the civilians caught in the crossfire, according to the Pakistani government. Drawing on his experience as the Joint Task Force Commander leading the humanitarian mission to aid the victims of Pakistan's earthquake in October 2008, Rear Admiral LeFever is once again working directly with Pakistan Army Lt. Gen. Nadeem Ahmad, Special Support Group commander, to distribute U.S. aid to temporary camps for those fleeing the fighting. "This humanitarian relief is a renewal of the continued relationship between the U.S. and Pakistan," the admiral said. "It only serves to better portray that sense of goodwill between allies in the fight against terrorist activities." "This is a terrible situation that has been settled on these people. We're basically the 9-1-1 emergency response," Rear Admiral LeFever said. "If they need anything else, we're standing by to help them in any way possible." As the relief supplies arrive, the admiral looks at broader picture. He foresees a rebuilding process after the initial emergency aid is delivered and the militant insurgency is quelled. "Just as we are continuing to help with the earthquake victims," Admiral LeFever explained, "we plan to continue supporting the IDPs. Our intent is to help rebuild and reestablish this area after so much turmoil ... so the IDPs can return to their homes." 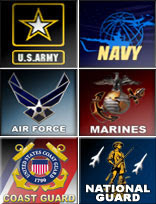 US Naval Forces Central Command. MANAMA, Bahrain - Commanders from the U.S. Central Command area of responsibility gathered in Bahrain May 20 - 22, for the USCENTCOM Commander's Conference to discuss regional security issues and approaches to these challenges. The conference, hosted by U.S. Naval Forces Central Command, brought together Gen. David Petraeus, Commander, USCENTCOM, Gen. Ray Odierno, Commanding General, Multi-National Force-Iraq, Vice Adm. Bill Gortney, Commander, NAVCENT, Lt. Gen. William Webster, Commanding General, U.S. Army Central Command and Lt. Gen. Gary North, U.S. Air Forces Central Command, among others. At the conference, commanders discussed various issues including operations in Afghanistan, Iraq, as well as counter-piracy efforts off the coast of Somalia. "We face, in this region, a number of interrelated threats and challenges, from transnational to state-centric, to those who blur the lines between the two," said Petraeus. "At the transnational level, violent extremism is, needless to say, the most pressing challenge. Al-Qaeda and its affiliates pose the greatest such threat to many states in the region." U.S. commanders also talked about the security architecture in place throughout the region and the need for cooperative comprehensive approaches with regional partners. "Such approaches involve significantly more than the application of just military or kinetic action," said Petraeus. "In fact, they must do far more if they are to address not just the symptoms of current challenges, but also their underlying causes. The lack of sustainable economic development in certain parts of this region, for example, is not just a social or humanitarian issue it is a serious security concern as well." Piracy, threats to the maritime environment and the need for continued cooperation with Coalition and regional partners through Maritime Security Operations was also discussed by commanders during the conference. "The complex threats that we face at sea require cooperative solutions," said Gortney. "We will continue to work with our partners in the region to respond to these challenges and help ensure peace and stability in the region. U.S. Naval forces have operated in the region for six decades and we'll be here for many more to come." Cross-posted @ Talon, and Rosemary's Thoughts. Rosemary's News and Ideas. Digg! ISLAMABAD, Pakistan (May 20, 2009) — Humanitarian aid provided by United States arrived at Chaklala Air Base near Islamabad this afternoon in response to an appeal for urgently needed basic food, shelter, and supplies for Internally Displaced Persons (IDPs) in the North West Frontier Province. The shipments, which arrived by U.S. military air transport included air-conditioned tents and more than 120,000 pre-packed halal meals. U.S. Ambassador to Pakistan Anne W. Patterson delivered the supplies to Lieutenant General Nadeem Ahmed, the government of Pakistan's coordinator of all IDP relief operation. The Ambassador was accompanied by the U.S. Embassy's chief military officer, Admiral Michael LeFever. "We understand the urgency of providing immediate assistance to those displaced and are committed to helping the Government of Pakistan meet their critical needs," said U.S. Ambassador to Pakistan Anne W. Patterson. The United States will continue to monitor the situation and is committed to providing additional assistance as needed. The deliveries follow yesterday's announcement by U.S. Secretary of State Hilary Clinton that $110 million in immediate humanitarian assistance is being provided by the United States to assist IDPs. Last week, the people of the United States provided $4.9 million to purchase tents, blankets, cooking sets, jerry cans, soap, and bedding. 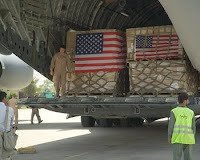 The United States also sent logistical equipment including generators, transformers to power water pumps, and other logistical and support equipment. This included laptop computers, rental cars, and internet connectivity to assist emergency support operations. In addition, $28 million in agricultural commodities including 50,000 metric tons of wheat valued at $16.8 million, and 6,800 metric tons of vegetable oil valued at $11.2 million was provided by the United States last week. This is a remarkable posted over at Congressman Tom McClintock's site. It is so nice to hear someone speak in a language I can not only understand but agree. Enjoy. The Eve of the American Reawakening. The following is an excerpt of a speech that Rep. McClintock delivered to the Council forNational Policy in Washington DC. Click here to read the entire speech. To those who say we should put the Reagan era behind us – I have a better idea. Let's put the Bush era behind us. To those who say we should redefine our principles, I have a better idea: we don't need to redefine our principles; we need to return to them. To those of the Republican establishment, who misled our party for years, who dismantled so much of what Ronald Reagan accomplished and now tell us "the other side has something" and we have nothing. To them I can't improve upon Cromwell's words: "You have sat here too long for any good you have been doing; it is not fit that you should sit here any longer. You shall now give way to better men. Now depart and let us have done with you, I say, in the name of God, GO!" "The other side has something and we have nothing?" What is the something the other side has – that some say we have to be respectful and mindful of? Statism. Shortage. Paternalism. That's their "something" that seems to so overawe and over-impress these scions of a failed party establishment. Statism, Shortage and Paternalism is what we are told to be mindful and respectful of? I don't think so. Their statism is "something" so extreme that the entire national debt accumulated from the first day of the George Washington administration to the very last day of the George W. Bush administration will literally double in the next five years and triple in the next ten. The tax increases already proposed to support it will rob every family of more than $2,500 from its purchasing power every year. We're supposed to respect that? The American people don't respect it. The American people know that you cannot spend your way rich; that you cannot borrow your way out of debt and you cannot tax your way to prosperity. And they know that if you live well beyond your means today, you must of necessity live well BELOW your means in the future. And that's not a future we want for our children. Their entire policy is predicated on maintaining shortages of everything from health care to energy and then using the force of government to ration that shortage according to their own whims. The "something" that they propose to solve their government-induced shortages is having bureaucrats tell us what medical treatments our kids may have and when they may have them; raising energy prices until we bicycle to work; telling us what kind of light bulbs to use, where to set our thermostats, when to use our appliances. And then there's Paternalism. That's what Rick Santelli was talking about. When your neighbor buys the house he can't afford – it's now your job to pay his mortgage. When the fraternity brothers of Paulson and Geitner party their investments into the ground – now it's your job to cover their losses. When the reckless country-clubbers of General Motors and Chrysler give away the farm to the UAW – now it's your job to make up the difference, and by the way, now it's Barney Frank's job to tell you what kind of car you may buy. That is the "something" that seems to send these self-described "New Republicans," into paroxysms of awe and policy-envy. That's the "something" that some people are so deathly afraid of saying "NO" to. Churchill said, "Alexander the Great remarked that the people of Asia were slaves because they had not learned to pronounce the word "NO." Let that not be the epitaph of the English-speaking peoples or of parliamentary democracy ... There, in one single word, is the resolve which the forces of freedom and progress, of tolerance and goodwill, should take." What is the "nothing" that we have that so dismays and disgusts these same messiahs of mediocrity – this "nothing" that's convinced them that we must wean ourselves from our unseemly nostalgia with such irrelevant has-beens as Reagan, and Lincoln and Jefferson – I add the others because they stood for exactly the same principles as Reagan. We stand for individual responsibility. Freedom. Abundance and Responsibility. That is our platform. Those who call that "nothing" are the same failed leaders who disdained it during the Reagan years and dismantled it as soon as the Reagan years were over. They stand for statism. 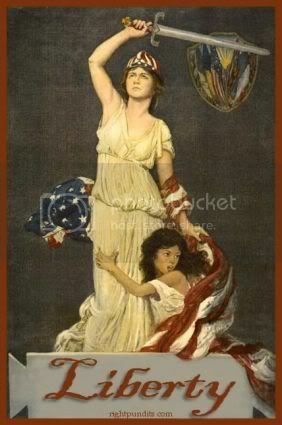 We stand for freedom: The God-given right to enjoy the fruit of our own labor; the right to raise our children according to our own values; the right to express our opinions and our faith freely and without reserve; the right to defend ourselves and our families; the right to enter into voluntary associations with each other for our mutual betterment without an army of busy-bodies telling us what is best for us. They stand for the rationing of shortage. We stand for abundance: what happens when free men and free women enjoy the liberty to go as far as their desire, talent and imagination can guide them and as far as their labor, industry and enterprise can take them. Societies prosper when freedom protects the rights of each of us to decide on our own what we will produce and what we will consume. Government exists to protect the conditions that produce abundance, not to ration shortages that government has caused. They stand for paternalism. We stand for personal responsibility. That means you stand by your promises. That means you tell your customers the truth about your products and investments. It means if you bring a child into the world then by God you look after that child. And it means if you make a bad decision, you set it right and you learn from it – and you realize that the bad decisions we all make from time to time is the price we pay for the freedom to make all the good decisions in our lives. Freedom. Abundance. Responsibility. Ladies and Gentlemen, that ain't "nothing." That's everything. Petraeus said the graduates will face frustrations as they move to new fields. “To the new lieutenants in this graduating class: you’ve chosen a unique and wonderful profession, but one in which, again, few tasks are ever simple,” he said. “The frustration of many of the situations with which leaders deal in combat is real and constant. KABUL (May 18, 2009) – The Afghan National Army’s top leaders convened here May 12 and 13 for discussions and teambuilding. The Corps and Commando Commanders’ Conference marked the first time leadership from the elite commando brigade and kandaks — battalion-size units — met with leadership from the army’s regional corps. The Afghan army’s five corps consist of infantry kandaks and other conventional forces, while the six commando kandaks are home to the country’s special operations soldiers. Ahmady and other senior commando leaders helped to provide a clear explanation of the commando kandaks’ full-spectrum capabilities and the proper way for the corps to request and use the elite warrior force. The conference’s first day included speeches and presentations from the commanders of the six commando kandaks and the executive officers of the 201st, 203rd, 205th, 207th and 209th Corps. Also present were the ANA Chief of General Staff B.K. Mohammadi and ANA General Staff Chief of Operations Lt. Gen. Shir Mohammad Karimi. Also attending were the commander, command sergeant major and senior Special Forces mentors of Combined Joint Special Operations Task Force Afghanistan, the Afghan commandos’ partnered unit. Although the main objective of the conference was to improve the working relationship between the corps and commando kandaks, the meeting also provided an open forum in which commando leadership could discuss issues and challenges faced at the kandak level. The second day of the conference featured open discussions with the leaders of different staff sections. Topics ranged from relaying the proper way to submit re-enlistment paperwork to brainstorming ways to improve secure communications among the commandos. As it turned out, officials said, the kandaks shared most of the same problems and were therefore better able to work together to find solutions. The commando kandak commanders also highlighted the activities and achievements of their soldiers, sharing videos of training and operations. All of the commanders spoke with pride of the operational successes of their troops. The commandos combined have conducted thousands of combat operations throughout Afghanistan since their inception in 2007. Other leaders, including the 1st Commando Kandak and 4th Commando Kandak commanders, shared the news that a great number of their troops now can read and write, thanks to language classes held within their kandaks. The conference was not all talk. The 6th Commando Kandak conducted a demonstration of combat techniques for the distinguished conference attendees. The audience was openly impressed as the soldiers convoyed into the area and reacted to a simulated bomb blast and follow-on firefight. Next, the troops sneaked up on a mock insurgent hideout and demonstrated their close-quarter combat skills while securing the building and removing an enemy fighter. Although the conference was an Afghan-led event and was primarily intended for Afghan leadership, Army Brig. Gen. Ed Reeder, commanding general of the Combined Forces Special Operations Component Command, was invited to share his thoughts with the group. “The spirit of this event is cooperation and coordination in the fight against the common enemy,” Reeder said. “The commando kandaks and infantry kandaks provide critical capabilities in this fight, but neither can win alone. Working toward a common purpose with knowledge of one another’s activities will create lethal results on the battlefield. The conference is tentatively slated to become a semi-annual event. WASHINGTON (May 17, 2009) – The Afghan national army could lead operations in Afghanistan in two to four years, with the U.S. playing a support role, Defense Secretary Robert M. Gates said during a May 8 interview, portions of which aired on CBS’ “60 Minutes” Sunday. As the handover of responsibilities to national forces in Afghanistan develops, it is likely to mirror security progress that unfolded in Iraq following the surge of U.S. troops there, Gates said during the interview, conducted with Katie Couric in Afghanistan’s capital city of Kabul. The Afghan national army has about 86,000 troops with a “significant number” of battalions leading joint operations with U.S. and NATO International Security Assistance Forces, Gates said. The defense secretary said the Afghan army is showing progress as the size of its ranks grows over coming years to the currently authorized number of 134,000 troops. He also expressed confidence in the Pakistani army’s ability to root out terrorist safe havens along its border with Afghanistan, but he used measured terms in providing his assessment, acknowledging that the situation is subject to change. Some 47,000 U.S. forces serve in Afghanistan -- a number that is rising as 17,000 additional American troops arrive there. Meanwhile, NATO member countries and partners have more than 32,000 forces in country. Gates, who has previously criticized the NATO contribution, reiterated his frustration at the disparity of force levels. As the U.S. begins to implement the Afghanistan-Pakistan strategy that President Barack Obama’s Administration unveiled in March, Gates described his impression of American expectations. Below please find the writings of one Muslim man who has been trying to fight the Islamofascists ever since I've been aware of him. I'm not asking you to totally trust him right off, you wouldn't do that for anyone else! I just ask that you give him a fair chance. Exclusive: Obama Administration Stacking the Deck with Islamists. M. Zuhdi Jasser. April 20, 2009. "The Battle Within": Moderate Muslim who co-founded the American Islamic Forum for Democracy examines complications with his faith - and the political world’s approach to it. By ALLISON KENNEDY - akennedy@ledger-enquirer.com. When President Barack Obama made his first presidential visit to the Middle East earlier this month, he was criticized by some groups for being too accommodating — in part because of his push for peace in the war-torn region and a two state solution between Israel and Palestine. An American Muslim physician who will speak in Columbus on Thursday is concerned that Obama wants to set back relations with the Middle East by 20 or 30 years. Inside Politics Weekend- Small Change. Should America make nice with the Taliban? Uh-h-h, maybe not, says M. Zuhdi Jasser, a former U.S. Navy officer, physician and chairman of the American Islamic Forum for Democracy. "President Obama's recent overture to the Taliban not only sends a dangerous message of appeasement to our sworn enemies, but it sends a lethal message of abandonment to all those who have suffered the oppression of the Taliban," Dr. Jasser says. Taliban Spokesman 'Paints' a Troubling Picture of U.S. Islamists. The brutality of the Taliban resurgence in Pakistan and Afghanistan has been well documented in the media. The danger officially metastasized into Pakistan on April 13 as beleaguered President Asif Ali Zardari signed into law the Nizam-e-Adl regulation. Translated from Urdu as the "System of Justice," this travesty gave the Taliban the right to dispense this so-called "justice" as per their interpretation of Shari'a law. It also gave them virtually unrestricted control of the Swat Valley. The Talibs have been quickly expanding their control in this troubled region of Pakistan, gaining strength and legitimacy. Most telling is what their spokesman Muslim Khan recently said in a CNN interview, not only about gladly harboring and protecting Osama bin Laden, but also about his desire to see Shari'a law implemented beyond Pakistan, even in America. The kicker is that for four years the Taliban spokesman lived in the United States, apparently working as a painter near Boston. Pious Muslims are needed to defeat Islamists. In his first three months in office, President Barack Obama has focused on creating a relationship of "mutual interest and mutual respect" with what he has described as the "Muslim world." His inaugural address, his interview on Al-Arabiya and his most recent visit to Turkey were all long on platitudes and apologetics toward the religion of Islam and Muslims, and short on specifics. Most recently, the new administration was even discussing making overtures with the "moderate" version of the Taliban in order to achieve a quick solution to the violence in Afghanistan, at the expense of long-term violations of human rights and Western ideals. While the president's public relations initiative may yield some immediate benefit globally as measured in the public opinion polls of Muslims abroad, this is hardly the kind of real needed "change" that will last generations. Our security is not threatened by the tactic of terrorism, but rather by those individuals who are driven by the political ideology that feeds the mind-set of radical Islamism. Religion and Politics Don't Mix? Because I am ill, I believe it is alright for me to share this e-mail written by Mark Alexander of PatriotPost.us. Thank you. For all of our nation's history, there have been tactical battles between opposing political ideologies -- liberals (leftists) who want to liberate us from constitutional rule of law, and conservatives who strive to conserve rule of law. Great political capital has been, and continues to be, expended by the Left in order to offend our Constitution, and by the Right in order to defend it. Amid the din and rhetoric of the current lineup of tactical contests, I ask that you venture up to the strategic level and consider a primal issue that transcends all the political noise. How many times have you heard the rejoinder, "Religion and politics don't mix"? Most Americans have, for generations now, been inculcated (read: "dumbed down") by the spurious "wall of separation" metaphor and believe that it is a legitimate barrier between government and religion. So effective has been this false indoctrination that even some otherwise erudite conservatives fail to recall that religion and politics not only mix, but are inseparable. Recall that our Founders affirmed in the Declaration of Independence "that all men are created equal, that they are endowed by their Creator with certain unalienable Rights, that among these are Life, Liberty and the pursuit of Happiness." In other words, our Creator bestowed the rights enumerated in our Declaration and, by extension, as codified in its subordinate guidance, our Constitution. Life, liberty and the pursuit of happiness are natural rights; they are not gifts from government. To that end, Alexander Hamilton wrote, "The sacred rights of mankind are not to be rummaged for, among old parchments, or musty records. They are written, as with a sun beam, in the whole volume of human nature, by the hand of the divinity itself; and can never be erased or obscured by mortal power." But the Left has, for many decades, made its primary objective the eradication of God from every public quarter, and routinely relied on judicial activism to undermine constitutional rule of law and, thus, the natural rights of man. The intended consequence of this artificial barrier between church and state is to remove knowledge of our Creator from all public forums and, thus, over time, to disabuse belief in a sovereign God and the natural rights He has endowed. This erosion of knowledge about the origin of our rights has dire implications for the future of liberty. Thomas Jefferson wrote, "Can the liberties of a nation be thought secure when we have removed their only firm basis, a conviction in the minds of the people that these liberties are the gift of God? That they are not to be violated but with his wrath? Indeed I tremble for my country when I reflect that God is just: that his justice cannot sleep for ever." As the author of our Declaration of Independence makes clear, we should all tremble that man has adulterated the gifts of God. Ironically, it was Jefferson who penned the words "wall of separation between church and state" in an 1802 letter to the Danbury Baptist Association. Jefferson was responding to a letter the Association wrote to him objecting to Connecticut's establishment of Congregationalism as its state church. Jefferson responded that the First Amendment prohibited the national (federal) government from establishing a "national church." After all, the controlling language (Amendment I) reads, "Congress shall make no law respecting an establishment of religion, or prohibiting the free exercise thereof..." Jefferson concluded rightly that the Constitution's 10th Amendment federalism provision prohibited the national government from interfering with matters of state governments -- a "wall of separation," if you will, between the federal government and state governments. Among all our Founders, Jefferson was most adamant in his objection to the construct of the Judicial Branch of government in the proposed Constitution, writing, "The Constitution [would become] a mere thing of wax in the hands of the judiciary which they may twist and shape into any form they please." Jefferson warned: "The opinion which gives to the judges the right to decide what laws are constitutional and what not, not only for themselves in their own sphere of action but for the Legislature and Executive also in their spheres, would make the Judiciary a despotic branch. ... It has long been my opinion ... that the germ of dissolution of our federal government is in the constitution of the federal judiciary; working like gravity by night and by day, gaining a little today and a little tomorrow, and advancing its noiseless step like a thief, over the field of jurisdiction, until all shall be usurped." Alexander Hamilton wrote in Federalist No. 81, "[T]here is not a syllable in the [Constitution] which directly empowers the national courts to construe the laws according to the spirit of the Constitution." But Jefferson was correct in his apprehension about our Constitution being treated as "a mere thing of wax" by what he called the "despotic branch," who would do the bidding of their special-interest constituencies rather than interpret the plain language of the Constitution. In 1947, Justice Hugo Black perverted Jefferson's words when Black speciously opined in the majority opinion of Everson v. Board of Education that the First Amendment created a "wall of separation" between religion and government, thus opening the floodgates for subsequent opinions abolishing religious education and expression in all public forums. John Adams wrote, "If men through fear, fraud or mistake, should in terms renounce and give up any essential natural right, the eternal law of reason and the great end of society, would absolutely vacate such renunciation; the right to freedom being the gift of God Almighty, it is not in the power of Man to alienate this gift, and voluntarily become a slave." It may not be in the power of man to alienate the gift of liberty, but it will certainly take the power of men, guided by our Creator, to defend it. To that end, religion and politics are inseparable. Here is some good reading material from Linkfest: The Pink Flamingo: Getting Away With Murder Almost, Woman Honor Thyself: Weekend!, Right Truth: The 57 State Solution - not a chance, The World According To Carl: My Wife’s Gastric Bypass Surgery Update, The Pink Flamingo: Lindsey Takes out Nancy Pelosi, third world county: twc Hiatus, and third world county: Testament of Freedom, thanks to Linkfest Haven Deluxe. 2. Adam's Blog: What Did Pelosi Know? 3. Woman Honor Thyself: Israel: The Truth. 4. Beagle Scout: Calling all Educators: Can the Science of Economic Success be Taught? 5. Woman Honor Thyself: New York: Muslims try to Kill Jews in Synagogue Bombing Plot.